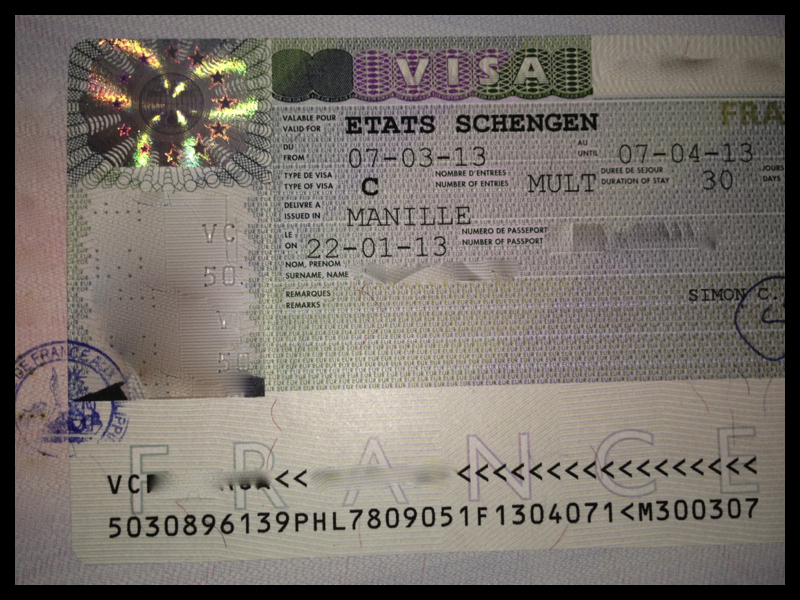 Everything about application for a Schengen Visa at the French Embassy in Manila can be found here. Now, make sure that all these documents are in order (organize them according to the sequence in their requirements list). Make sure EVERYTHING has a copy. Even your passport pages with stamps. It wasn’t on their list so I didn’t have these prepared, but they still asked for it. So I still had to go down and photocopy it and waste time 😦 Have the set of originals separated from the set of photocopies. They’ll be getting the photocopies. Also remember, time is gold, so answer in a concise manner. Straight to the point. Don’t go on giving information that they’re not asking. 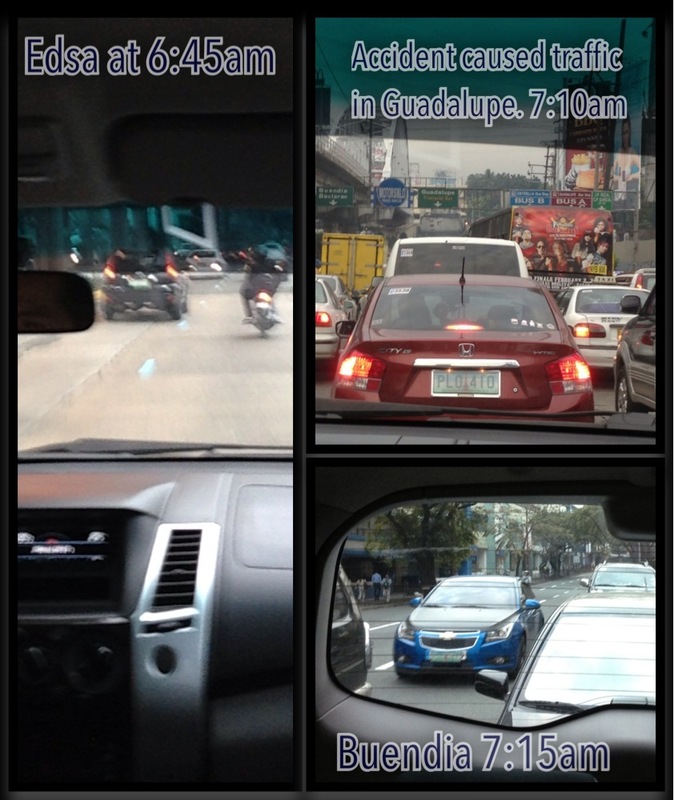 EDSA traffic in the morning. My appointment was set at 8am. I was told to be there 30mins early. 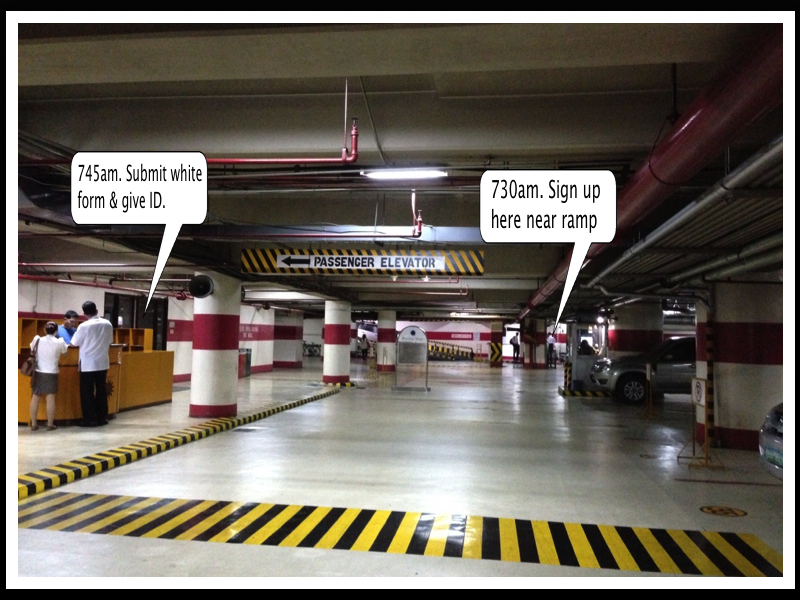 You’ll be asked by the guard at the lobby entrance to go to basement 1 to sign in and fill out a slip. By 745am you’d be asked to line up, submit the white form and surrender an ID to get a guest pass. 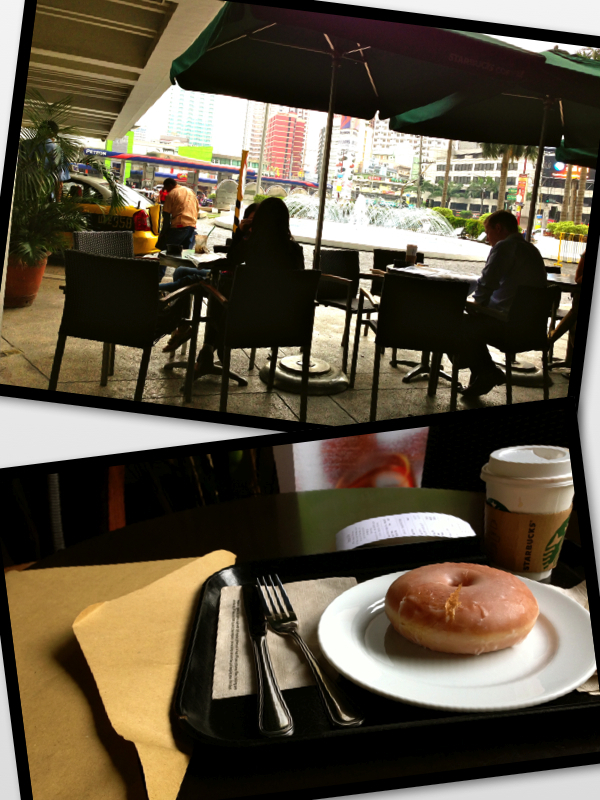 I was a bit early so after signing up at B1 I waited in Starbucks on the ground floor. You will then be asked to go to the 16th floor. I was the 9th person to sign in but when we got to the 16th flr they’d call your name to line up according to their own list for the 8am interviewees. Thank God I was #3! We went through security and deposited our celphones. Don’t worry they’ll give you a pink stub to claim it. Just make sure you don’t lose it coz they’ll surrender the phone to anyone who gives them the stub. 8am we were inside seated waiting for our numbers to be called in window 1. By 815am they called my number. The woman in window 1 asked for my docs and I gave the originals. She went through them and asked Who i’ll be going with and purpose of travel. Then she asked in a certain tone why I was applying there. I said coz it was my point of entry. She then said “NO you don’t go here, you apply where you’ll be staying the longest (referring to the 2nd leg of the trip)”. 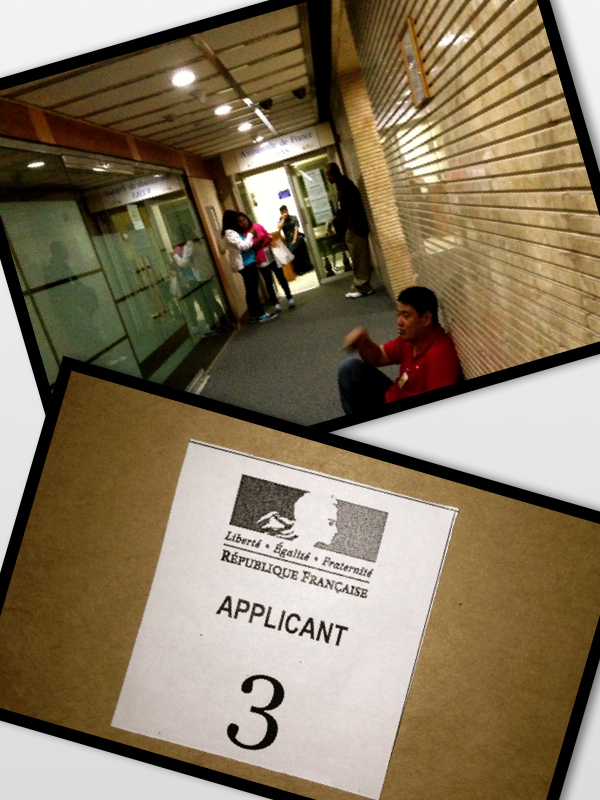 I read the requirements and procedures prior to applying at that French embassy and I was certain I din’t make a mistake. So I said with conviction “No. I’m staying the same amount of days in both places.” Then she looks at my docs again and says “oh ok I thought… (she recounts the days on my itinerary with her fingers)…alright”. She then asks me to pay 3,260Php. Imagine if I had listened to her and just nodded and left I’d be going home empty handed, wasting time, money, and precious sleep. Anyway, she got my payment and asked to be seated to wait for my name to be called. By 830am my name was called at window 3. Another Filipina was there to get my photocopied set of documents. I had fingers scanned and picture taken right there. She then goes through my docs and asks me to tell her about my business. I answered her in a short and precise manner. She asked who I’d be going with and asked if they were US/Canadian citizens then asked if we had family in Europe. She was about to ask if I had visas then she sees the photocopy of my U.S and Canadian visas. Then she makes me photocopy the pages of my passport with stamps. I go to B1 and photocopy then back up to the same girl to give it to her. She then gives me a white slip to pick up the passport. 9am I headed back home…so I thought. 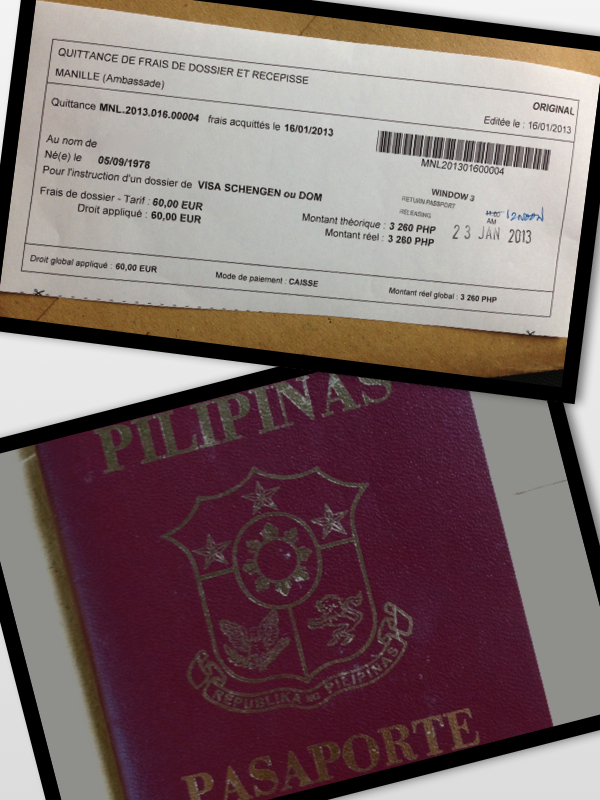 But upon getting to Guadalupe, I looked into my envelope of docs and guess what I saw…MY PASSPORT! Holy Crap! The girl didn’t ask for it and just asked for the photocopies! So long for having a short trip! It was a bit traffic already but had no choice but to go back. I got there by 945am and waited till she was done with the current applicant and went to her window. I showed my passport and said “you forgot to get it” (of course with a smile), and she says “that’s right, thank you”. 10am I headed back home. Good thing it only took me 10min. to get home just in time to take the kids to school. This is how the Schengen Visa looks. Btw, you can’t just go to any European embassy to apply for a Schengen Visa. If you’re going to multiple destinations, go to the embassy of the country you’d be staying the longest.